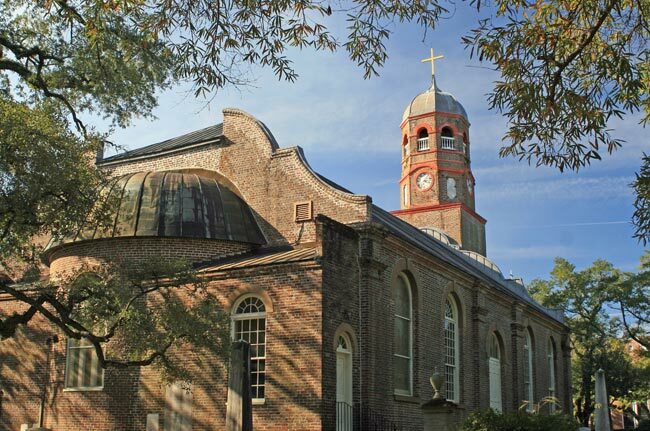 Prince George Winyah Episcopal Church is located in the historic seaport town of Georgetown. 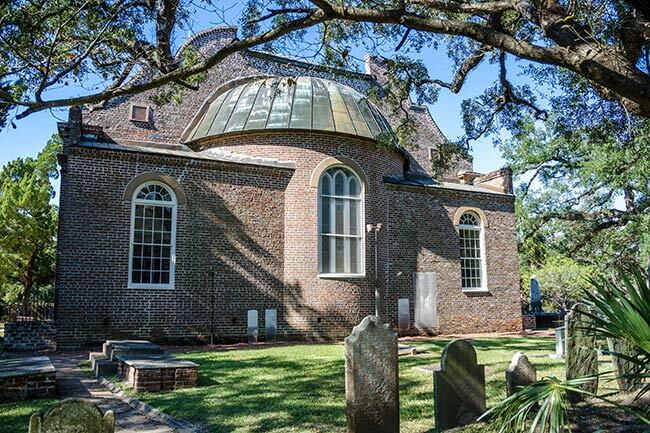 It serves one of the oldest congregations in South Carolina, dating back to 1721. Bricks for the church were collected as early as 1740, though the cornerstone was not laid until 1744. 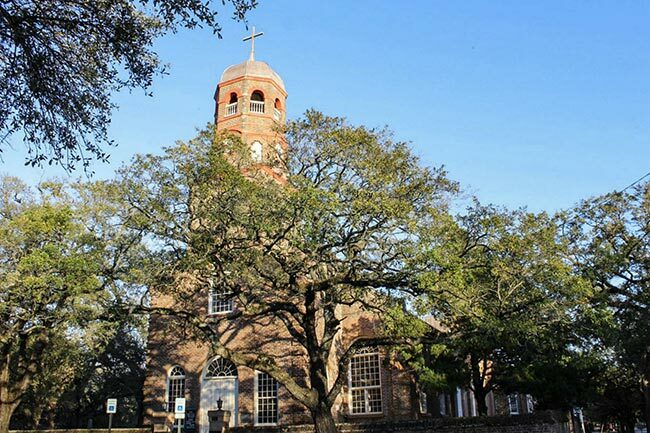 Construction was completed two years later and the first service was held on August 16, 1747. The church is constructed from English red bricks held together with local oyster shell mortar. While the design is typical of many colonial churches, it does have several notable features including English stained glass windows and a Jacobean gable. The church’s interior is lined with traditional box pews and features hand-carved woodwork and flagstone flooring. 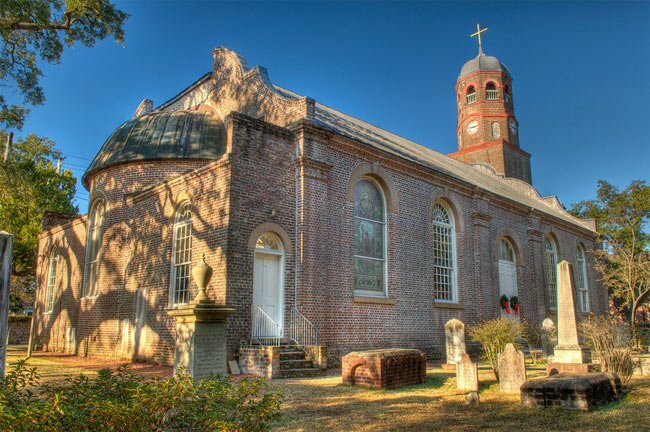 The church was severely damaged during the Revolutionary War and was even used as a stable for British troops. Yet the edifice received repairs and several additions in 1809. 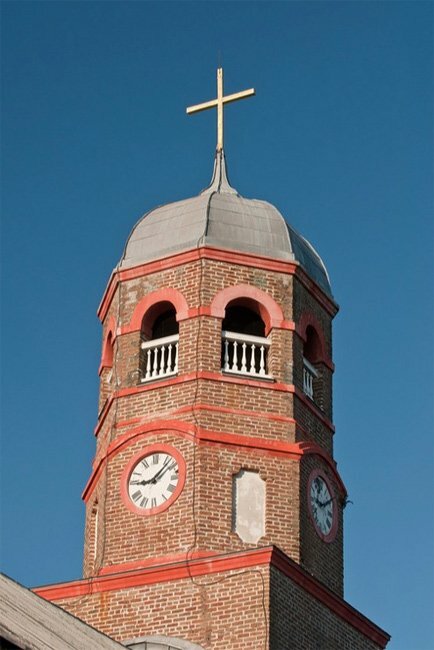 The tower and steeple were not added until 1824. Several notable South Carolinians, including Governor Robert Francis Withers Allston, are buried in the church’s cemetery. Below is a two-part article that was contributed to the South Carolina Picture Project by Bill Segars of Hartsville. It originally appeared as two separate columns in his local paper, The Darlington News & Press. Part I was published on November 30, and Part II was published on December 7. After almost a year break from writing church articles, I’m back. My loyal church article readers allowed me the time needed to concentrate on finishing a book about early church buildings in South Carolina. Churches in South Carolina Burned During the American Revolution: A Pictorial Guide is finished and printed. When Jana Pye, the editor of the News & Press, contacted me to ask if I was ready to submit another church article, I jumped at the opportunity to talk about one of my “old friends” that is explored in detailed in the book. Prince George, Winyah is truly a functional historical jewel in South Carolina. “Functional historical jewel” are words typically not used together, but all three words apply to Prince George, Winyah. 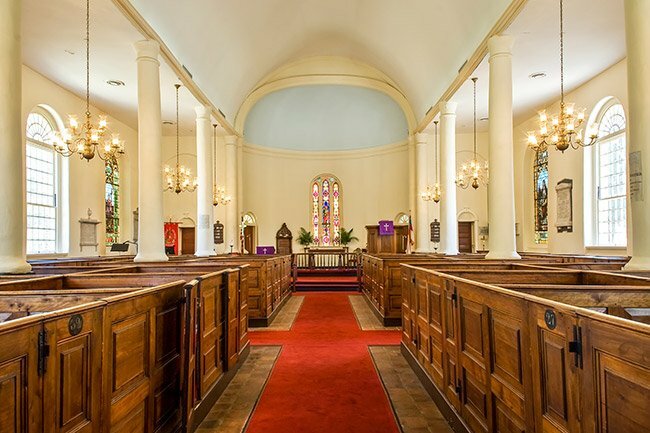 It’s “functional” because the building is used every Sunday with a very active congregation, “historical” because many elements of the building are over 269 years old, and “jewel” because its rare beauty sparkles in downtown Georgetown. 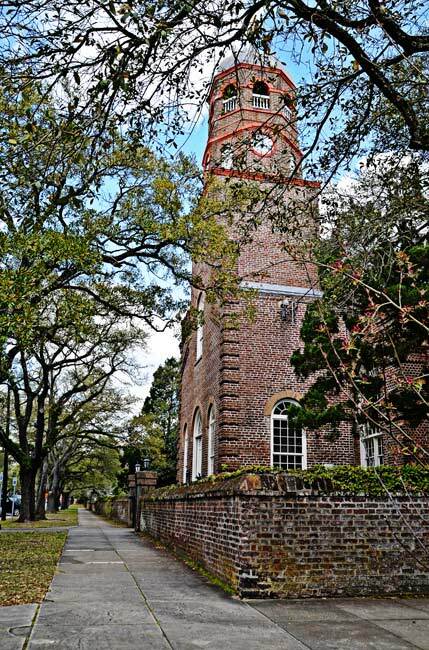 Prince George is the only remaining regularly used church building in South Carolina that experienced flames at the hand of the British soldiers. Prince George, Winyah also has Pee Dee area connections and even currently has Darlington County connections. 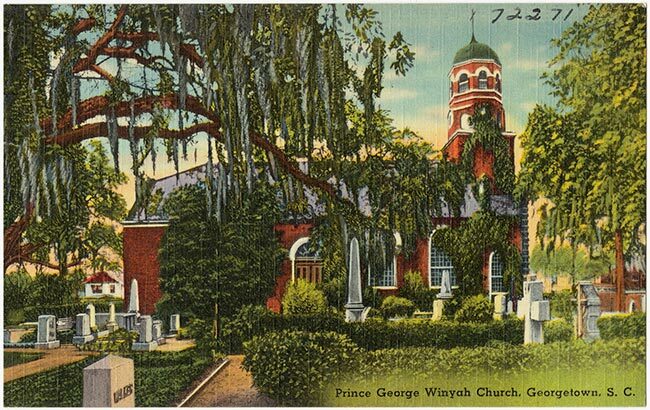 As the population of South Carolina began to grow in the Georgetown area due to the cultivation of rice, the Anglican Parish of Prince George, Winyah was established on March 10, 1721 from land previously in the 1706 St. James, Santee Parish. A church building was quickly built about 12 miles north of present day Georgetown on the Black River. In 1734 another parish was established, Prince Frederick’s Parish, and oddly, the first Prince George building fell in the newly formed parish boundary. The present Georgetown community was founded in 1729, and the port opened for business in 1732. So in 1734 when the need arose to relocate the Prince George Parish church building, the corner of Broad and Highmarket Streets, downtown Georgetown was the perfect place. In 1740 bricks were being gathered to build the new parish church. By 1744 enough brick and material had been collected to begin construction on the church, so the cornerstone was laid on October 30, 1744. Progress was slow but the edifice was completed enough to hold the first worship service in the unfinished interior on August 16, 1747. 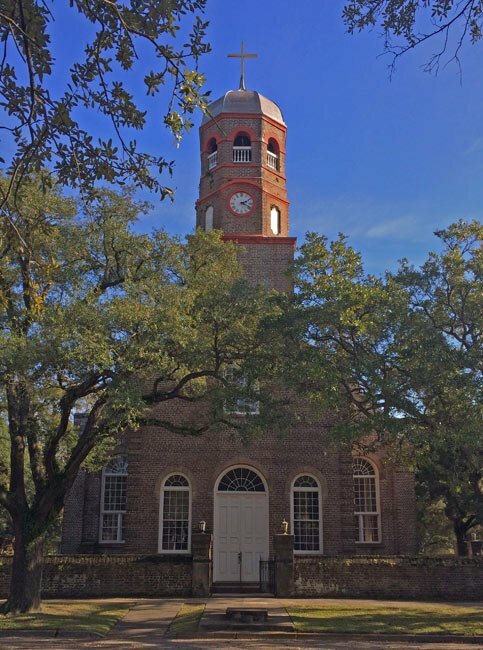 By 1755 the interior of Prince George, Winyah had been completed and the proud congregation was looking forward to many years of service that this beautiful building would bring to them. Unfortunately, the British soldiers and the American Revolution had different plans for Prince George. When Georgetown fell to the British in June of 1780, the building that was used to stable the British troop’s horses was the Prince George Church building. This devastating abuse to the building continued until General Francis Marion approached Georgetown on May 28, 1781, causing the British troops to evacuate the town. In August of the same year, British troops tried unsuccessfully to retake Georgetown, this time from the sea. It’s unknown exactly when or to what extent the British burned the church. It was either in May or August of 1781, but the burning of the church and many other buildings in Georgetown is well documented in historical records. The burning of buildings, particularly churches, was customary for the enemy troops as they left an area in the face of defeat. Due to the fact that the exterior of Prince George is built of load-bearing brick walls, it is my opinion that the fire consumed only the interior components and the wooden roof structure of the building. This would have left the building as a burned-out shell which could have been repaired and built back. We’ll dig deeper into the reconstruction of Prince George next week. But first let us back up a little bit to 1774 when the St. David’s Anglican Parish Church was being built in the Pee Dee area. 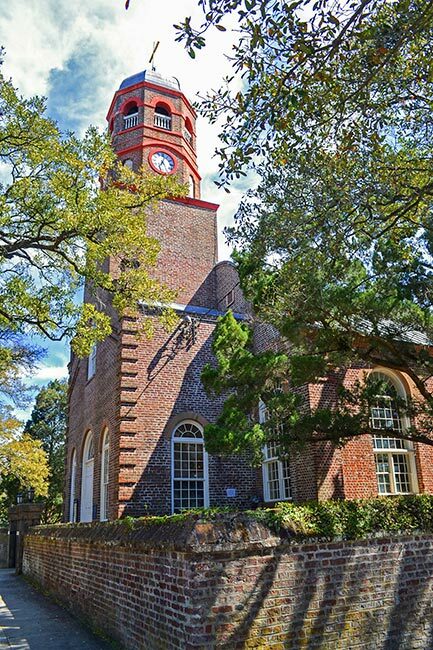 St. David’s Parish, headquartered in Cheraw, was the last of the 23 Colonial Anglican Parishes established before the end of the American Revolution. 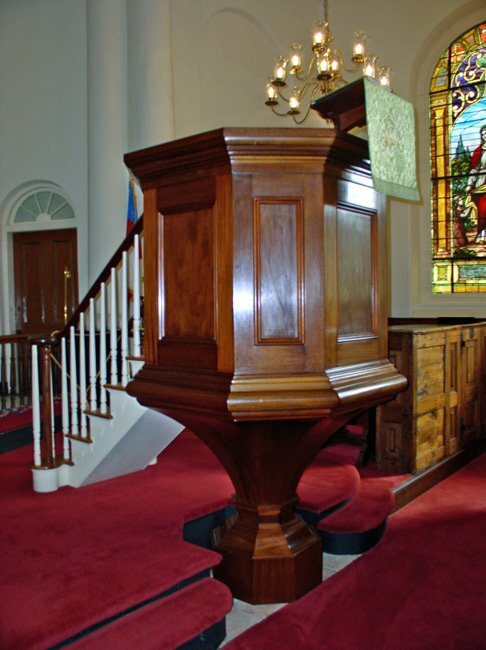 Some members of the St. David’s congregation must have seen and liked Prince George’s beautiful wine glass pulpit, because they sent their builder, Thomas Bingham, to Georgetown to study and draw the pulpit with the idea of returning to Cheraw and duplicating it in their building. He produced such an accurate version of it that when Prince George’s interior was burned, a Georgetown craftsman was sent to Cheraw to duplicate the pulpit yet again. Both are still in existence today for us to enjoy. Return with me next week when we’ll learn more about the reconstruction of Prince George, Winyah and its Darlington County connection. If you would like to purchase a copy or need a gift for that “hard-to-buy-for friend,” the books are available at the Darlington County Historical Commission, located at 204 Hewitt St. in Darlington. It can also be ordered from Amazon, by typing in the book title, for $25. Last week we learned about the original construction and the unfortunate burning of the Anglican Parish church of Prince George, Winyah in Georgetown during the colonial South Carolina growth period. We’re now in the mid-1780s, the American Revolution is over, British troops have returned to England, and the 13 original colonies are learning how to handle their new freedom and govern themselves as the United States of America. British troops would return for a couple of years in June of 1812 but would leave without severe consequences for the newly-formed country. Many factors played into the growth of the Georgetown area, many of which exist today only in our history books. Agriculture played a significant part in this growth with the planting of rice, indigo, and cotton and the large plantations that their income brought to the area. The water of the Black, Pee Dee and Waccamaw rivers flowing into the Winyah Bay and on into the Atlantic Ocean spawned shipping trade to the area. Growth also came from factors that were not as attractive and glamorous as the plantation lifestyle; thousands of slaves worked the agricultural fields and hundreds of pirates ruled the water with ships, cannons, and sabers. But they all combined to make Georgetown and South Carolina what they are today. Money was available from the sales of goods and products, so congregations were very willing to return a portion of those sales to the church and restore or rebuild their houses of worship. 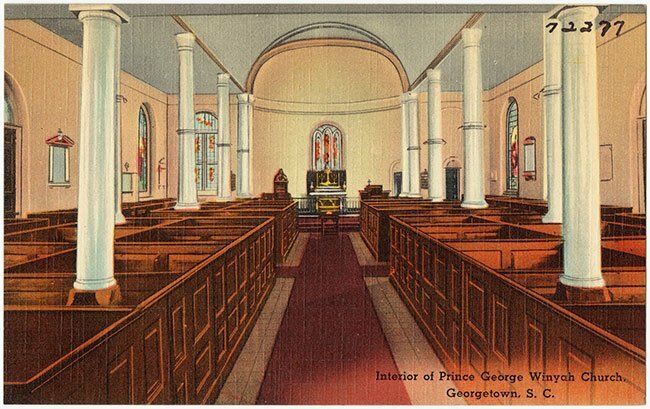 Having used the Prince George building for about 25 years prior to the fire, the congregation realized where changes and expansion would be beneficial during the reconstruction period. As a new roof structure was being installed in the late 1700s, a gallery was added in the nave, and a chancel was added to the east end of the nave. The building was repaired and ready for use by 1809. The bell tower on the west end of the nave was added in 1824. With the addition of the chancel on one end of the original 50’x80′ building and the bell tower on the other end, much of the original 1747 Curvilineal Jacobean roof style has been covered up, but it’s still there – you just need to look for it. There is no written evidence concerning the construction of the current box pews (seen above). 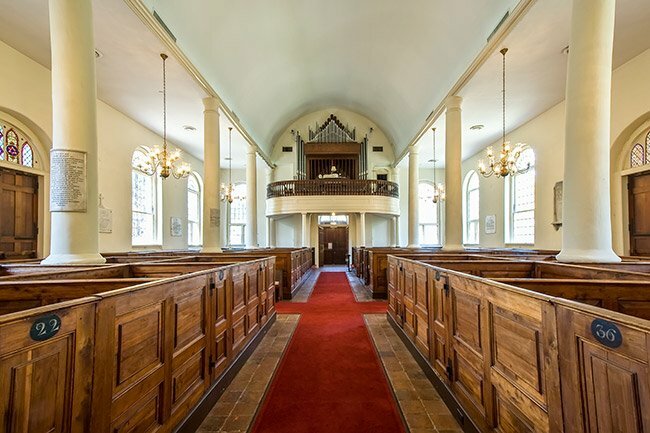 Logic dictates that if the interior was burned in 1781 and the burned roof was rebuilt in 1788, the box pews were constructed between 1788 and 1809. 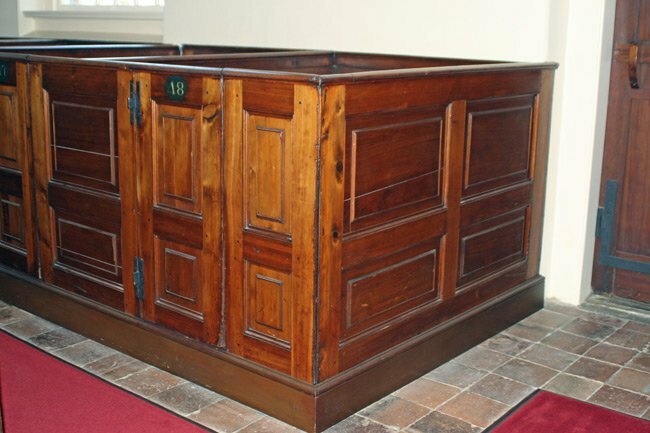 Regardless of exactly when these beautiful heart pine raised panel box pews were built, they are an excellent example of colonial period craftsmanship – a time when pride in the end product meant more to the craftsman than the quick production of that end product. 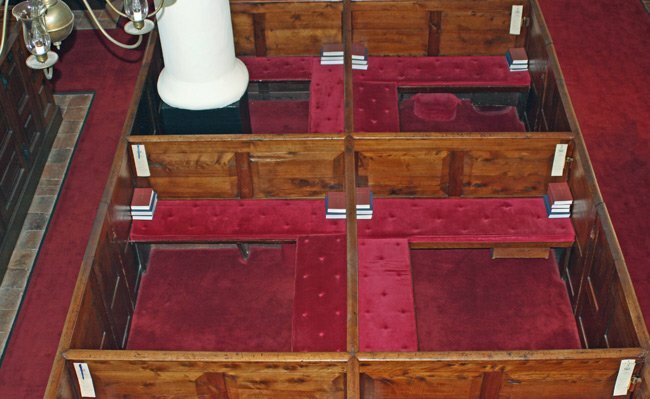 The box pews, built in a “U shape” with a door, hold many little interesting secrets. One that I’ll mention is the connection of the box pew with the early building’s heating methods in the cold winter months. Families would sit in a designated pew as a family unit. The family would bring with them, from home, hot bricks in a metal bucket. That bucket(s) would be placed on the floor of their box pew for the purpose of keeping them warm. The family in the next box pew would do the same. With the many buckets of hot bricks and the members’ body heat in the building, the building was then heated. This process certainly encourages 100% attendance for Sunday service, doesn’t it? Maybe we need to go back to bringing hot bricks to church on Sunday. What a nice message! God bless you and yours as well! Attended this lovely church between 1961-1962. My youngest son was christened there! Enjoyed looking at the photos and reading the history! I wish you all the best, God bless you all, yours in Christ. Beautiful old church. So glad the historical buildings are kept.